When WWI started, the size of the German army and its strategy of marching through Belgium took the French and the British by surprise. The German army had nearly reached Paris when a counter-attack caught it over-extended and it was forced to retreat. After a month and a half of desperate fighting, the Allies and the Germans built lines of fortifications that stretched across Europe from Switzerland to the Belgian coast. These lines would change little during the next four years. Once the war entered a static phase, the planes’ primary role was to observe the enemy’s fortifications and rear areas to determine when a major push would occur and to serve as spotters for artillery. Bombs could be dropped from planes but the fragile aircraft could not carry the powerful bombs needed to cause serious damage. Planes on both sides had been unarmed at the start of the war, but guns were soon mounted on the planes, as each side tried to maintain control of its own airspace to deny the enemy information about its defenses and planned offensives. The faster models became pursuit (fighter) planes, which either hunted enemy observation planes or protected their own observation planes. 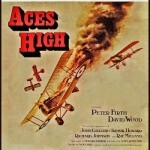 Three Americans, Jerry Young (Fredric March), Mike ‘Slug’ Richards (Jack Oakie) and Henry Crocker (Cary Grant), join the Royal Flying Corps, but Crocker washes out as a pilot, and is made an observer, while both Young and Richards become pilots. Arriving at an airfield in France, Young is sent out as the pilot of a two-seater observation plane, ordered to take photos of enemy batteries. Returning from his first flight, Young is rejoicing that he shot down his first plane, but his joy disappears when he discovers that his observer is dead. However, everyone else is used to people suddenly dying, and just carries on. After going through five observers in two months, Crocker shows up as Young’s new observer, and they prove to be a good team, until personal issues drive them apart. Young receives several medals, but has started drinking heavily. Asked to say a few words to a group of new pilots, Young visibly squirms and barely gets through it before returning to the bar. As his roommate, Crocker is aware that Young is cracking, and convinces Major Dunham (Guy Standing), the commanding officer of the squadron, to give Young ten days leave. Returning to London, the war hero is invited to a society party, where he attracts the attention of a beautiful woman (Carole Lombard). However, the death of yet another observer during a battle with an enemy ace is the breaking point. Clearly on the edge of a nervous breakdown, Young can not even eat during a dinner in his honor. Making a surprisingly anti-war speech, he rages that he was given medals for killing kids, but the rest of the squadron continues their merry-making. The war is almost over but it seems unlikely that he will survive, since he is unable to bear the burden of all the men he has killed. The film is a brutal look at the consequences of turning innocent young men into killers. Although it has been described as anti-war, a better description would be that it is against the glorification of war. An exchange between Young and Dunham after his first flight shows that men had to harden themselves to survive. Dunham comes over while Young is grieving after his first flight and asks: Did you get your photographs? Dunham: Yes, he is, did you get your photographs? While removing the photographs, Young gets the observer’s blood on his hands, but Dunham simply comments that he will have to get used to it. The blood is far from graphic, and the acting is very restrained but it is a powerful scene. 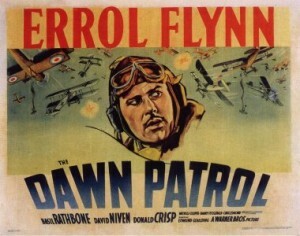 Unlike The Dawn Patrol (1938), where the pilots carouse to forget their fear and the pain of losing friends, Young drinks to cope with the guilt of killing men, which explains the perception that it is an anti-war film. Before his first flight, Young is warned that the work is dangerous but vital. It was. Most of the aerial combat involved one side trying to shoot down the other side’s observers, but the photographs were necessary to determine whether the enemy was planning an offensive in the sector. Observation planes often remained stationary in the air to monitor shelling and radio adjustments to the artillery. 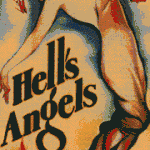 Most WWI films that deal with aerial combat focus on duels between aces, but the real work was done by the observers. However, the script is a bit confusing, mixing up two-seater fighter planes and two-seater observation planes. Pilots flying the former hunted enemy fighter planes and racked up high kill counts, while pilots of the latter took pictures and did not shoot down many planes, except to defend themselves. Jack Oakie is supposed to be funny, thus proving that tastes in humor change. The encounter with The Beautiful Lady (that is how Carole Lombard is listed in the credits) is strange, but it seems disconnected from the rest of the story. Young goes to London, where he is picked up by a beautiful woman, who seems to understand him, or at least observe that he is troubled. They spend the night together, and he returns to the airfield slightly restored only to learn that yet another friend has died. In most movies, the relationship would develop further, or she would at least be named, but she never appears again. The movie was made after the introduction of the production code but the beautiful lady is quite aggressive, inviting herself into his taxi. She just listens quietly while he complains that he hates being a shining example for killing men. It is obvious that they go off together, even though they don’t know each other’s names, but it could not be shown because of the code, so there is just a fadeout, as if the director could not be bothered figuring out how to stay within the code. 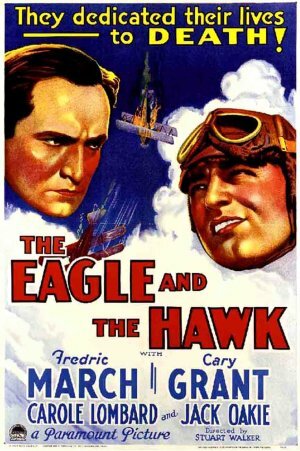 Unavailable until recently, few people have heard of The Eagle and the Hawk, but it is worth watching. The action scenes are excellent, if brief, it deals with complex issues that were only starting to be addressed openly, and the ending is dark, unexpectedly dark. Thanks. I had never heard of this which is amazing considering the cast. Can’t wait to see it. I came across it by accident, and had the same reaction as you. also, I was really surprised by the ending.